So my niece is learning to enjoy cooking — at least I think she is learning to enjoy cooking. She keeps telling me about one of her favorite recipes right now. Salsa Chicken. I am not sure where she got the recipe, probably Pinterest since she is young and it is all the rage with people right now. I know I have seen the recipe in the past, but I have never really liked tomatoes enough to try it. You might be familiar with me and tomatoes. I have grown a little more tolerate of them. Also recently I purchased a salsa from the deli section and it was very good. It was a garlic salsa. So I was thinking that it would be great in my niece’s recipe. But, of course, when I went to the store they didn’t have it. I bought a different one, it was a “medium” salsa and it proved to be too hot for me. But I just took a little of it off my chicken and it was fine. Super yummy in fact. I see why my niece likes this recipe. It is super flavorful. It is easy and really yummy. 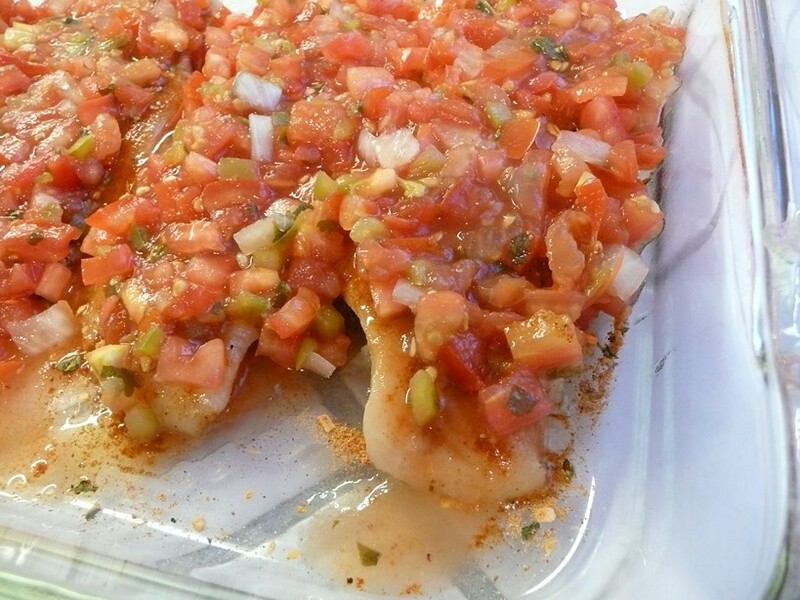 So here is how I made the Salsa Chicken. 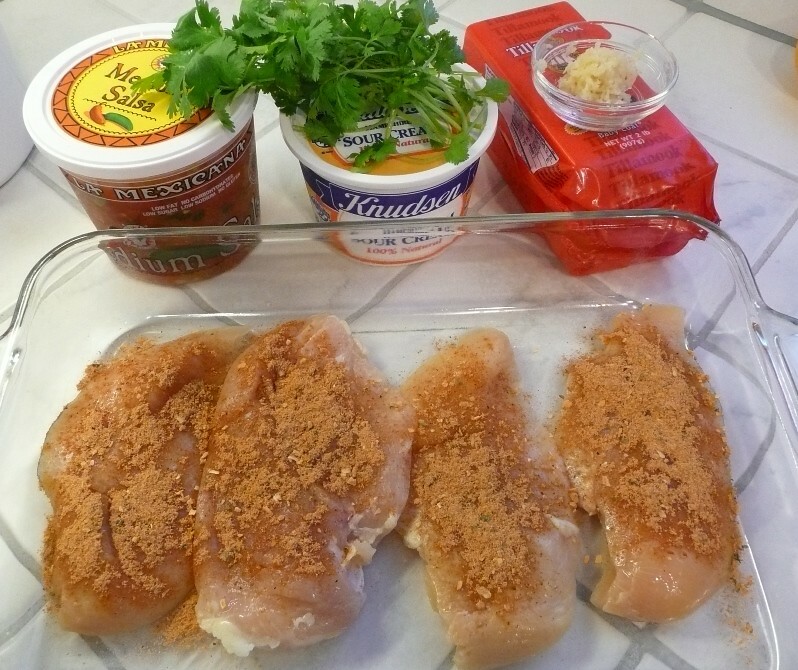 Place chicken breast in a 9×13 (or similar) baking dish. 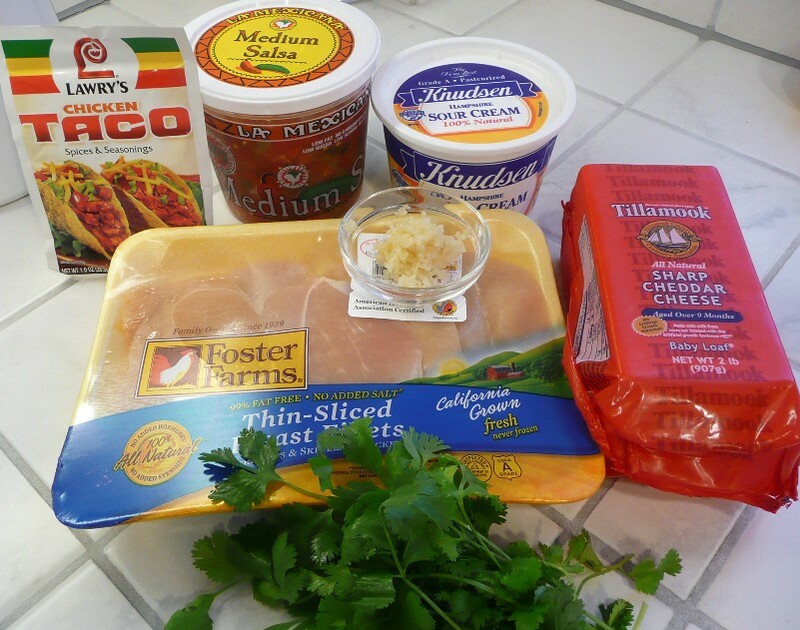 Season both sides of chicken with taco seasoning. Sprinkle garlic on chicken. Cover with salsa. Bake for 20 minutes, until chicken is almost fully cooked. 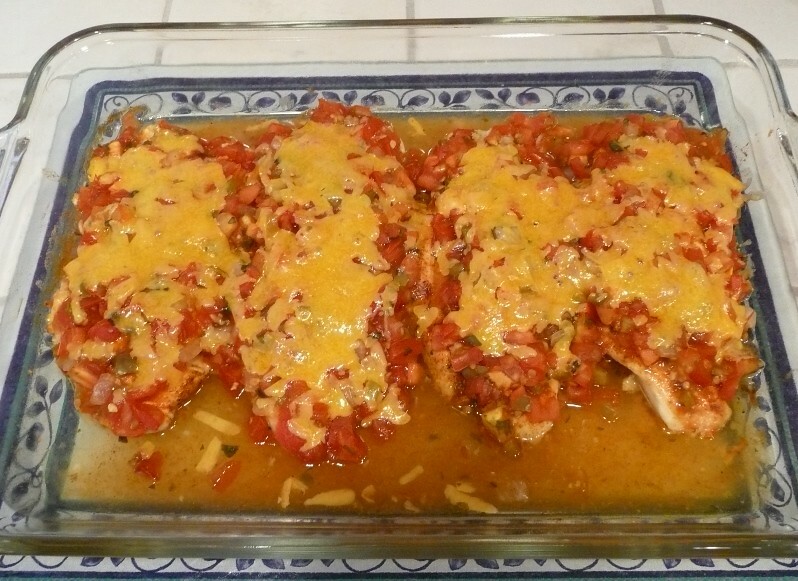 Sprinkle with cheese and bake until melted and chicken is fully cooked. To serve, top with cilantro and sour cream if desired. The store I was at only had thin breast filets. That is why I used them instead of regular chicken breast halves. So with the THIN filet I cut the baking time from the original “25-35 minutes” to just 20. Nothing ruins a great chicken recipe like over-cooked chicken. So, keep in mind that if you are using thicker breasts the time will probably be a little longer than 20 minutes. Also the recipe my niece gave me called for 4 tablespoons of taco seasoning. I measured out the package and I thought it was only 2.5 to three. But whatever it was . . . it fully covered the chicken. So this can be another one of those things that you can adjust to your liking. I didn’t measure the salsa. I just put enough on to cover all of the meat. I had a 20 ounce container and I used most of it. So I am guessing it was about 16 ounces. Again, adjust for your tastes. And since I had imagined using the garlic salsa, I put garlic on the chicken. Not a necessary ingredient. I did use the cilantro, but I don’t eat sour cream. I bet if I did it would have helped cool down the “too hot” salsa. My hubby loves sour cream and he used it. My niece said she served the chicken with “FarmHouse Mexican rice and corn”. I don’t even know what that is. I just used plain white rice. I spooned the liquid from the pan onto the rice. So the rice was salsa-y. It was very good. My hubby loved it so now I have another recipe to add to my menu regulars. It is so easy. I wanna thank my niece for motivating me to try this. My husband also wants to thank her because — again, super yummy. And since it is so easy it will be a regular dish here at our house. So . . . what’s for dinner? This entry was posted on May 22, 2014 at 3:09 pm	and is filed under "Recipes", Food. 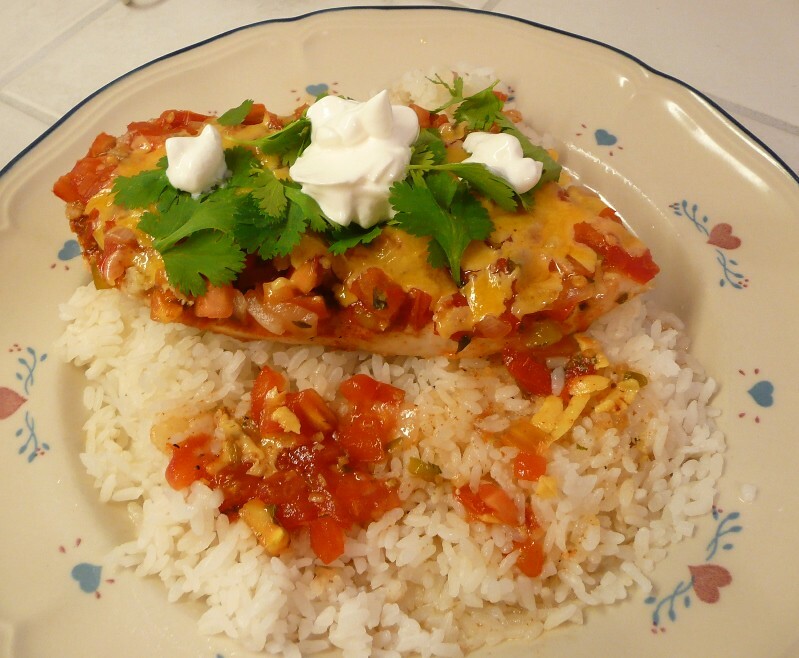 Tagged: easy dinner, easy recipe, garlic, hot salsa, Mexican rice, Pinterest, quick recipe, regular menu, salsa chicken, skinless chicken breast, skinless thin chicken breast filets, tomatoes taco seasoning. You can follow any responses to this entry through the RSS 2.0 feed. You can leave a response, or trackback from your own site.